One of my goals for this year is to finish and quilt all the quilt tops I have accumulating here. This one was started as a demo for a class at gather here. I made the strips in the center as part of the demo and eventually sashed it at home. Then it languished neatly folded in a stack of tops awaiting quilting. And here we are now. Done and dusted. At 68 x 70 inches, the plan for this one is the bed or the couch. It’s a snuggler, nothing fancy. 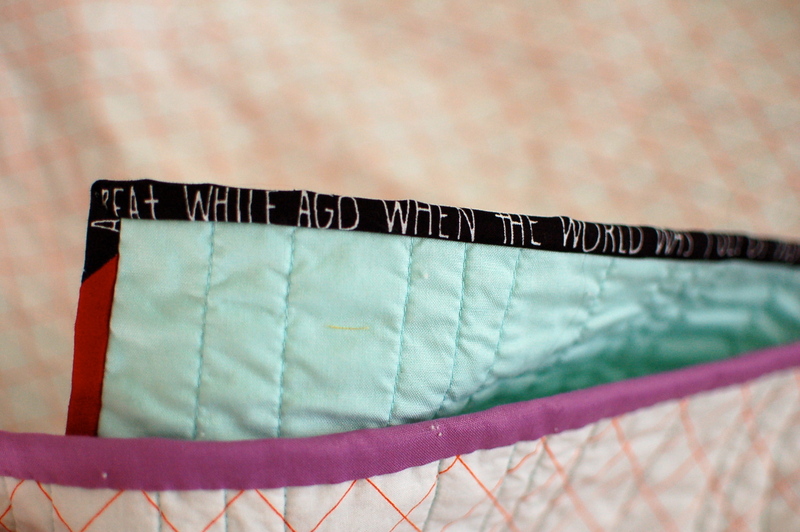 I’m not totally crazy about the quilting, but I’m OK with it enough to leave it be. 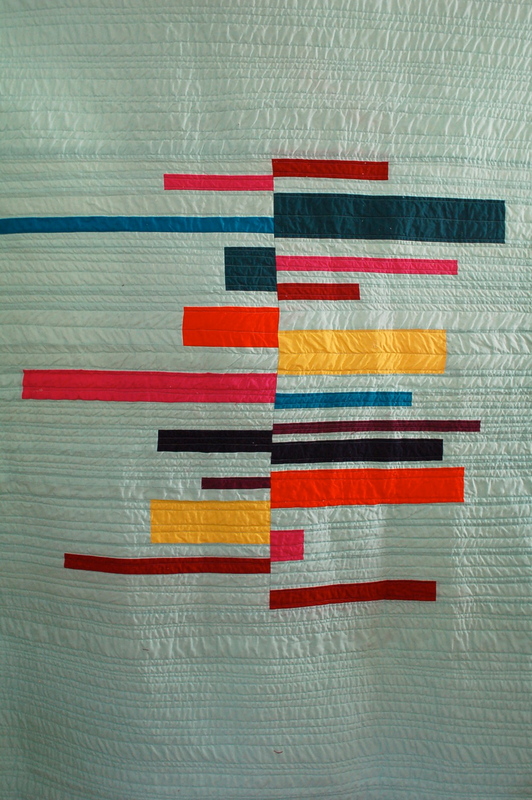 I kinda wish I had done some free motion quilting on it rather than straight up parallel lines. There will be other tops to FMQ, though. I do want to write a tutorial for this process because it’s pretty easy and fun, and it allows the maker a lot of flexibility to really make the “recipe” work for their specific vision/voice/style. Though my students each used the same set of instructions, each top looked totally different based on fabric selection, palette, and dimensions. After all, no matter what we make, it’s the little details we choose to include that add up to the sum of us. Yay! 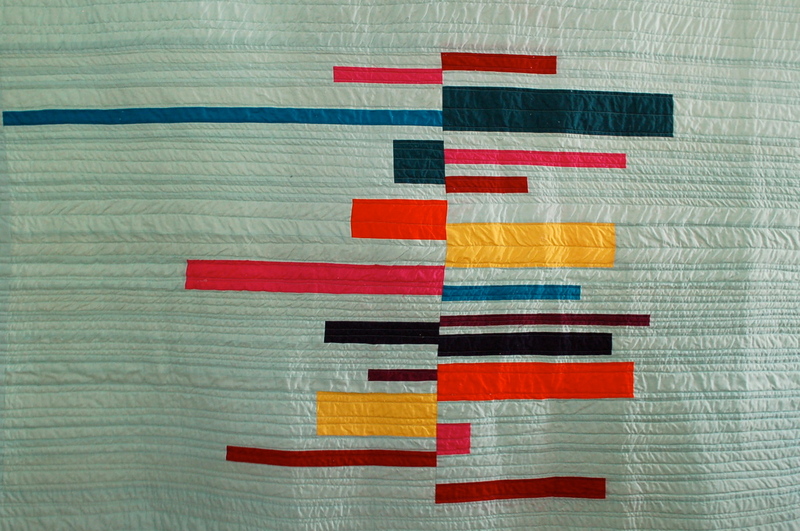 Congratulations on quilting this. 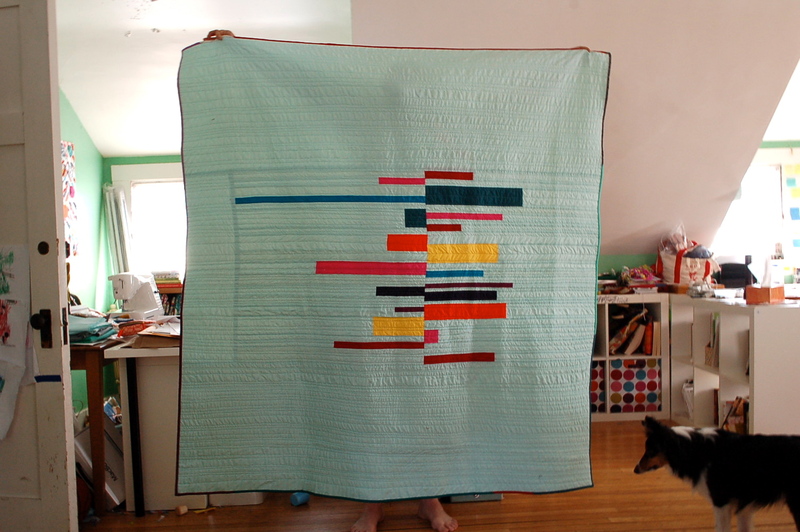 I think it looks great with the horizontal quilting lines echoing the color bars. That must have taken you a good number of hours, considering how big a quilt it is. I love the photo too. The dog is about to tackle something–and I hope it’s not the quilt edge or the person’s bare feet!